The term “bulk mail” (often referred to as “presorted” mail) refers to larger quantities of mail prepared for mailing at reduced postage. There are two types of bulk mailings; Standard and Non-Profit Presort. Standard Presort applies to advertising or mailings giving general information, whereas Non-Profit Presort is generally used by entities trying to raise money for a not-for-profit organization. Western qualifies for a Non-Profit permit, so all of our prices will reflect this class. PLEASE NOTE: There is no guaranteed same day services for bulk mailings. The purpose of the discount is with the understanding that the mail is not given priority over first class mailings. They are, in fact, considered third class mailings. Exceptions may be considered depending upon the load of first class mail that we have in that day, but because no mailing date beyond “within 48 hours” can be given, please plan accordingly. ► How do I know if my mailing qualifies as “Bulk”? Is your mailing at least 200 pieces total? 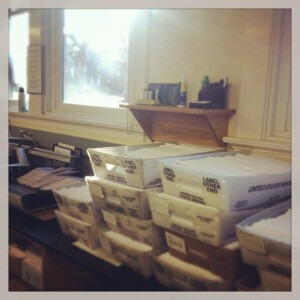 Is your mailing mass produced with no personal messages included? Is your mailing going to addresses only within the USA? Does an individual piece in your mailing weigh less than 16 ounces? Does your mailing have a complete return address printed on it? Does your mailing have an ancillary endorsement below the return address (Return Service Requested or Address Service Requested)? If you replied “yes” all of these questions, then your mailing qualifies to be sent Bulk Rate! ► How do I design my Bulk mailing? Whether your mailing is generated in your department, in the WOU Print Shop or by a contractor, it is necessary to ensure that your mailing meets the requirements for a proper bulk mailing. Almost anything can be sent as a non-profit bulk mailing if it is prepared correctly, but formatting is fairly strict. Check out my mail piece design guidelines before printing any mailing. This can save not just money, but time and the frustration of having to re-print. When preparing your bulk mailing, there are a couple different choices you must make before mailing them out. If you chose to have your mail metered at Mail Services, please contact us after you have designed your mail piece. 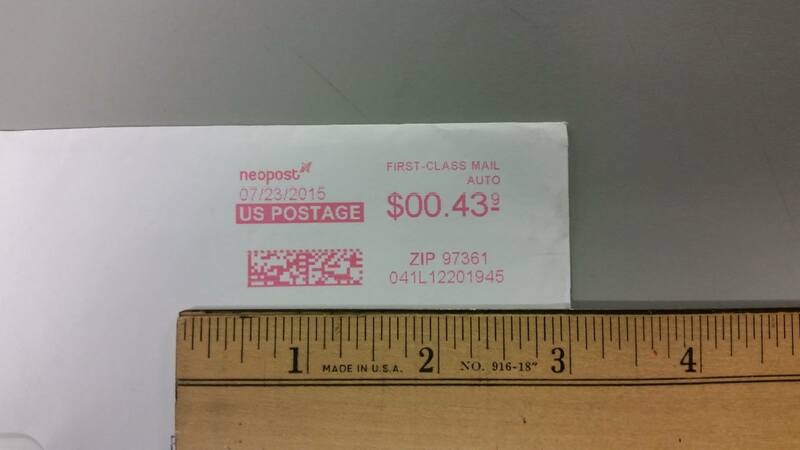 It is very important that a 2″ x 3″ white space is left in the upper right hand corner to place postage, because the meter-print requires this much space. We can look it over for you to ensure your design has sufficient room for the type of stamp we must print. 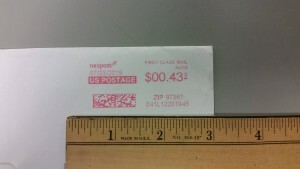 This type of mail has an imprint in the upper right hand corner (examples shown below). It is strongly suggested that this imprint be used on all postcard sized mailings, as well as any that have the postage placed somewhere other than the top right hand corner. While we can put a meter print on all mailings, sometimes it will not look as professional or slick as if you had used the imprint. ► How do I prepare my Bulk mailing for mailing? After the mailing has been printed, and you’ve decided whether you want it to be metered or have the imprint placed on the piece, the mailing needs to be organized in preparation for mailing. Remember: the “rule of thumb” with bulk mailings is that they should take less time for any mailing entity to process; hence the incentive for a discounted rate. Mail Services requires an exact piece count on all mailings, so if one is available, then we would appreciate the information. All pieces must be identical in weight and contents. Prepare mailing as necessary (fold and stuff into envelopes if applicable), and put one piece aside as an example for Mail Services. It is not necessary to seal envelopes, but it will make your mailing process faster. Separate the mailing into “Oregon” and “Out of State” categories. Oregon mail must be sorted by the FIRST THREE DIGITS of the zip code (Ex. All letters going to 971 would be together, all letters for 972, 973… and so on we refer to this procedure as “first three”).After sorting all Oregon mail, rubber band each category separately and securely place sticky notes on each one indicating which “first three” zip code it falls under. 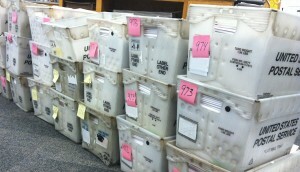 Depending on the size of the mailing you may label the trays or tubs or place the sticky note on the bundles of mail themselves. As long as you’re consistent it doesn’t make a difference. “Out of State” should set aside in a tray separate from “Oregon” mail. While it is good to keep the states organized together, it is not necessary to organize them into zip code order. Place bundles in a box or tray, facing the same direction and securely attach a note with the index number you would like to be charged and bring to Mail Services or request a pick up by calling 88-383 or by submitting your request online here: Schedule a Pickup. If your mailing list has been CASS/NCOA certified, please keep a copy of the certification available just in case the post office requests proof. ► Bonus: Ancillary Endorsements, what are they? Ancillary service endorsements are a tool used by mailers to request an addressee’s new address and to provide the USPS with instructions on how to handle undeliverable-as-addressed pieces. The two endorsements most commonly used by WOU are “Return Service Requested” and “Address Service Requested”. It is strongly suggested that one of these endorsements be placed on bulk mailings that have not been updated in a while or CASS/NCOA certified. If the endorsement is not on a bulk mailing being metered, the mailing may not be forwarded to the addressee, and the sender runs the risk of never being informed of updated information. The mail piece will be returned to you with the corrected address. The return charge is according to weight. A 1 ounce piece will be $0.49, 2 ounce $0.70 and so on. You will then pay additional postage to mail the piece out once the address has been corrected. The mail piece will be forwarded to the addressee and you will receive a copy of the pieces with the corrected address, which will cost you $0.59. If you have used a non-existent address or mailed to a person who has vacated the address over 12 months prior the mailpiece will be returned to you and you will be charged the weighted fee. This can be as much as $1.21 on a 2 ounce piece. Want a printable handout of this information?